Are These Avocado Toast Sneakers Why Millennials Can’t Afford Homes?I mean sure, why not? Reebok Just Unveiled 4 New SneakersFans of eccentric sneakers will love these. 14 Pairs of Sneakers to Wear When You Get Sick of SandalsMake your feet the center of conversation. This Is the New ‘Fashion Sneaker’ of the SeasonWhy is everyone suddenly obsessed with Air Force 1s again? Nike’s Newest Concept Is for Female SneakerheadsAll of the brand’s hard-to-find kicks will come in smaller sizes. The Soho Intersection That’s Become a Streetwear DestinationWith stores like Stadium Goods, Billionaire Boys Club, Palace, and Off-White, Mercer and Howard Streets form a new kind of outdoor mall. Nike Reimagined Classic Styles for Women and They’re So GoodSee all ten here. Tom Sachs and Nike Want to Take You to Space CampIt’s part obstacle course, part art installation. Get the Glittery New Vans for Opening Ceremony Before They Sell OutSo shiny! 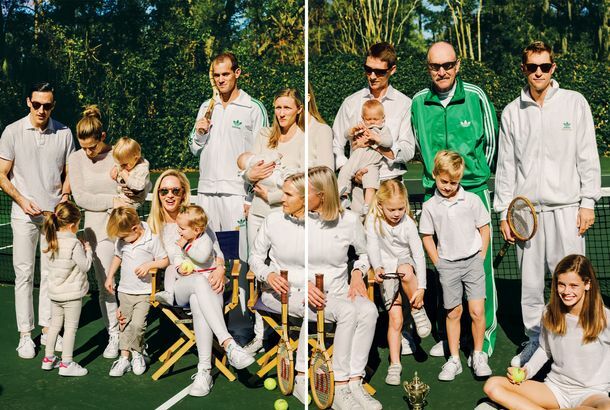 Stan Smith Knows You Think He’s Just a SneakerHe’s no Serena Williams, but he scored big in footwear. Meet the Ex-Sneakerhead in the American Ballet TheaterJeffrey Cirio dresses like no one else in ballet. The Easiest Way to Look Like a Fashion InsiderAnd the most comfortable, too! This 16-Year-Old Has Made Millions Selling Rare SneakersA day in the life of Benjamin Kickz. 100 Years of New York’s Sneaker CrazesOur sneakers are our cars, which means some are legendary. Fancy Kicks: 10 Spectacular Sneakers to Wear NowFrom Nike to Fendi. Would You Trade a Kidney for Yeezys?Trick question, that’s illegal. Moms Put Sneakerhead Teens on BlastSneaker love is true love. The Genius Nikes You Can Put on With One HandThe company worked with a teen with cerebral palsy to design the new LeBron Zoom Soldier 8 Flyease. No, the White Sneaker Trend Is Not OverKeep it going. The Illustrator Who Dreams Up Fanciful Sneaker CollaborationsBalenciaga x Jeff Koons, Nike x Jurassic Park, and more. Inside the World of Extreme Sneaker CollectorsTalking to the director behind the new documentary, Sneakerheadz, about the obsessives who view sneakers as art. Kanye’s Latest Sneaker Up to $16 Million On EBaySweet baby Yeezus that’s expensive! Can a Few Sneakers Make Couture ‘Young and Hip’?Seems like an oxymoron. Listen, Nike, Women Can Be Sneakerheads TooWhere can we get those Air Force Ones in our size? Meet the New Teen Sneakerheads Flipping Shoes for Cash, Fast“It’s better money than selling weed,” one 15-year-old says. Could You See Michelle Obama in Lanvin’s Spring High-tops?They come in pink and purple! Video: Taboo of the Black Eyed Peas Proves Dancing Is Easier If You Wear SneakersWe caught up with the singer last week at Saks Fifth Avenue to check out his new shoe collaboration with Jump. Taboo of the Black Eyed Peas Created $298 SneakersBecause when you think of the Black Eyed Peas, you think luxury, right? What Would You Sacrifice to Own Kanye West’s Nike Air Yeezy Sneakers?People started lining up at a Las Vegas boutique yesterday to get the kicks. Video: Sneakerheads Who Keep Separate Apartments for Their ShoesWe checked out their collections at New York’s first annual SneakerCon.